(He found it on a website called Futility Closet) First of all, I love the phrase “prodigy of imbecility,” and I plan to incorporate it into my day-to-day dialogue, post-haste! Secondly, I’m obviously not the only weird kid in the room! I too, think there is beauty in dazed ignorance, and I find great cheer in that idea. Sometimes we comprehend something best when we don’t focus on it, when we see it glancingly from one side, when it flies off with a rustle of bright feathers into the shifting leaves. The less we can capture and hold something, the more beautiful it is. The more something grows and changes and decays, the more beautiful it is. And the more beautiful something is, the less we can imitate it or make a replica of it, because in freezing it we destroy it. I was reading about Yasujiro Ozu, a while back, and I came across the phrase mono no aware, coined by 18th century Japanese scholar Motoori Norinaga. According to my feeble understanding of the concept, this is a sort of sighing recognition of the transient beauty of all things–an idea that everything is more beautiful at the beginning and the ending, as it grows and as it decays, as it changes. And this understanding extends to all things that live and die, however inconsequential they seem. They have beauty worth noticing–they’re made beautiful because they’re noticed. And this feeling, this poignance, washes gently over a person, almost without their effort…it’s the feeling itself that is beautiful and important, but it can’t be studied or captured in words. Whereas in Western art, we try to define aesthetics, and seek symmetry or embellishment, and try to capture beauty in marble or oils, according to mano no aware (as I understand it) the beauty is in sensing imperfection, irregularity or decay, in feeling the sweetness and the sadness of it. Surely this is “one of the deepest and strangest of human moods.” This is the graceful, ever-changing, incomprehensible voice of the garden at night and the sloping meadows, which we love because we can never fathom it, we can only soak it in with dazed ignorance. I love broccoli rabe, with its tenderness, and its bitterness, and its strong pleasant flavor. I’m the only one in my family that craves it. David will enjoy it from time to time, and the boys won’t go near it, so I feel like it’s the most indulgent thing that I cook. I make it because I want to eat it. This particular preparation was a sort of compromise. The boys do like curried chickpeas, so I served this with basmati rice, and picked out the chickpeas for them, and saved all the tender greens for myself!! Warm the olive oil in a large skillet over medium heat. Add the garlic, shallot and ginger. Stir in the red pepper flakes. Cook till the garlic starts to brown, and then add the chickpeas. Stir to coat. Add the spices, and immediately add the spinach and broccoli rabe. Stir to coat with spices and oil. Add 1/2 cup water, cover the pan, and cook for about twenty minutes, till the greens are quite soft. If the pan dries out, add more water as you go. Remove lid. Add the butter and lemon and cook till the pan is dry. Stir in salt and pepper, and drizzle with honey. Serve over basmati rice, if you like. 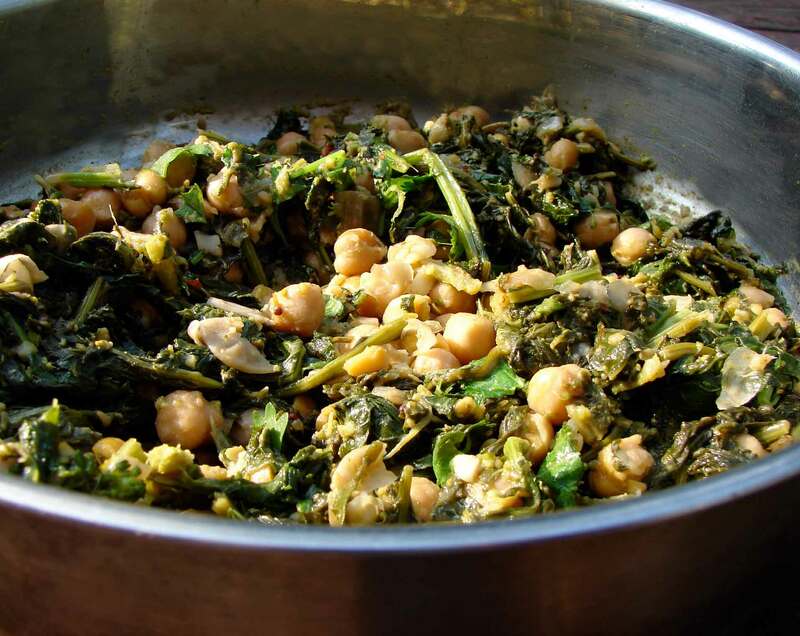 This entry was posted in beans, recipe, vegetable side dish and tagged browning, chesterton, chickpeas and greens, curried broccoli rabe, curried spinach, mono no aware, ozu, saag by Claire. Bookmark the permalink. I love a spicy chickpea, though I only get to cook them when I’m eating alone. It would be a good name for a band!